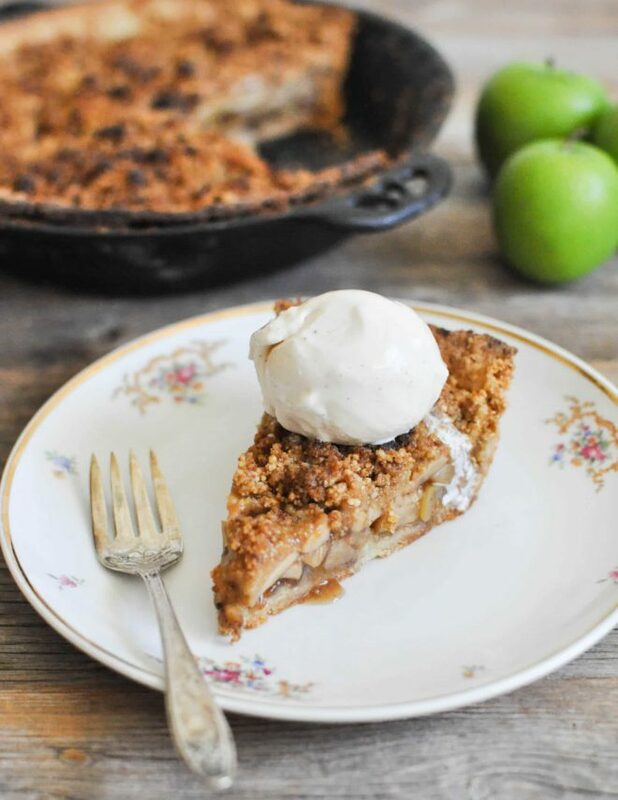 This Healthier Dutch Apple Pie is the REAL DEAL! 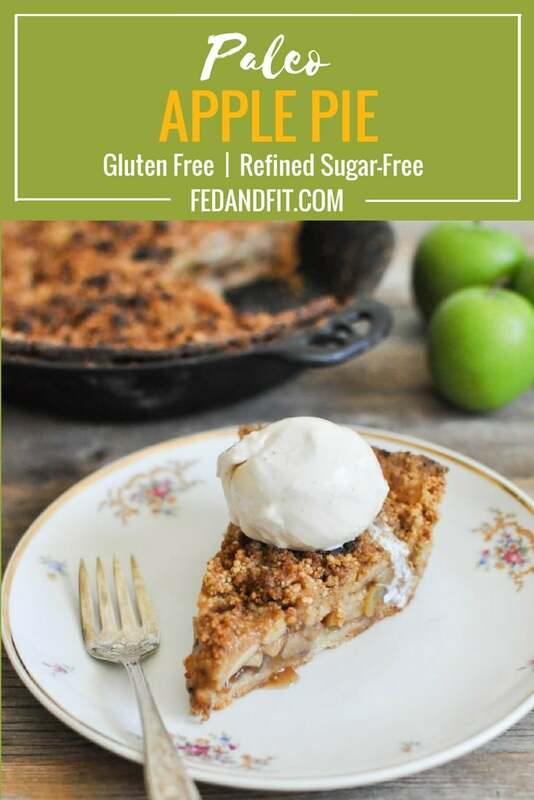 The perfect, buttery grain-free pie crust comes together with a blend of almond flour, coconut flour, and arrowroot starch, then is filled with apples and finished with a simple crumble topping and coconut whipped cream for the perfect holiday dessert. I like to collect favorite foods. I like to keep a mental list (which has since spilled over into a written iPhone list) of the most favorite foods of those dearest to me. Though one of my sisters will happily eat buckets of lemon-drenched steamed spinach for days (hi, Kimberley! ), the majority of my favorite foods notes are desserts. Nothing says “you are so loved, seen, and though-of” like someone surprising you with your favorite dessert.” My friend Amber loves s'mores and Morgan loves strawberry shortcake. My mom loves a well-prepared chocolate cream pie, my father-in-law loves coconut cream pie (must be made entirely from scratch so's to remind him of his childhood), and Austin (hubby) loves a simple chocolate sheet cake. I keep these notes stashed away so that when their birthdays OR the need for a special surprise pop up (like someone had an especially great or an especially bad day), I can sweeten the deal with a gift of their favorite sweet. Whenever I pull out the surprise dessert, I'm always met with a “did you know, this is my favorite dessert? !” remark. Ha! AS IF this were an accident. Nope, you were thought of and shown attention in the way I know best: a special treat made with an extra sprinkle of love just for you. Some of us have favorite foods that evolve with the seasons, too. For example, my dad will go gaga over a key lime pie during key lime season, but during the holidays, he's all about that Dutch Apple Pie. Today's recipe is an ode to my first love, my sweet dad. 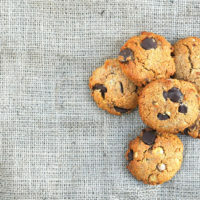 As with all things made with an extra sprinkle of love, a LOT of care and attention went in to developing this recipe. It took a few tries, but by golly, if it isn't perfect, then I don't know what is. When my whole family migrated over towards a mostly grain-free, Paleo-friendly dietary approach, I knew the holidays would be tough. I knew that the stuffing and the pie would be missed and I couldn't imagine my dad sitting down at the Thanksgiving or Christmas table without a piece of Dutch Apple Pie to polish off his feast. 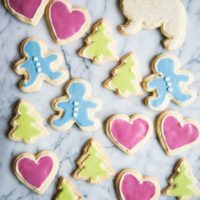 SO, I got to diligent work recreating some treats that taste just as good as the original without leaving my loved ones with painful joints and holiday headaches (what wheat gluten does to our family). This Healthier Dutch Apple Pie is so GOOD, you guys! 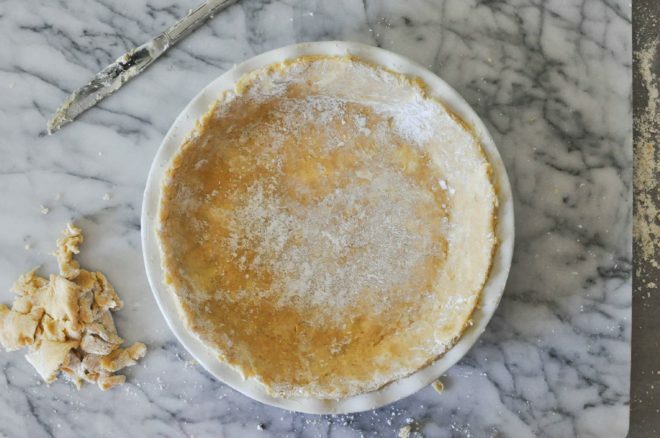 If you decide to make my pie crust from scratch (as I have outlined here), GOOD ON YOU. It's an old-fashioned crust made the old-fashioned way. DO NOT be afraid to dust liberally with extra arrowroot as you prepare the crust, it can handle it. The collage below shows exactly how this crust comes together. You can do this! The filling of this Healthier Dutch Apple Pie is a dreamy blend of apples, some natural sweeteners, spices, and a little thickener to help form that classic apple pie “gravy.” The topping is then a perfect crumble that has a little crunch, a little sweetness, and plenty of butter. For the best results, I recommend you let this pie cool completely before serving. A scoop of vanilla bean ice cream made from grass-fed cow's milk (or other dairy-free alternative) makes for a LOVELY addition. I hope you enjoy it and that it helps offer a healthier alternative for one of your loved one's favorite foods, too! Whisk them together until evenly incorporated. Pull the chilled and cubed butter out of the refrigerator. Quickly toss the butter in the dry ingredients. 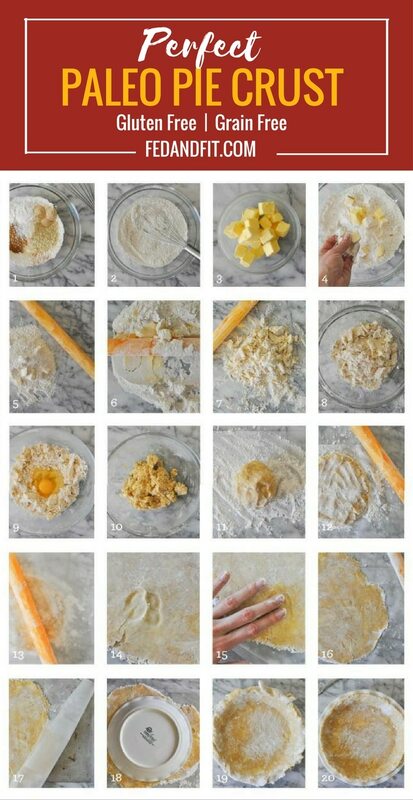 Pour the dry ingredients and butter onto a clean countertop or marble pastry board. Using your cold rolling pin, start to roll the butter into the dry dough. Keep rolling and folding more flour over the butter until all the butter is pressed into long, very thin sheets. It will look very crumbly and not well incorporated – this is how you want it. 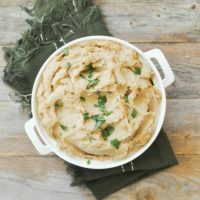 Gather the dough up, place it back in the mixing bowl, and refrigerate for 30 minutes further – this helps keep the butter firm. Take the dough from the refrigerator and create a small cater in the center. Crack the cold egg into the middle of the dough. Quickly mix the egg into the dough until it’s incorporated, but still shaggy. Place it (plus your rolling pin) back in the refrigerator to chill for an additional 30 minutes. 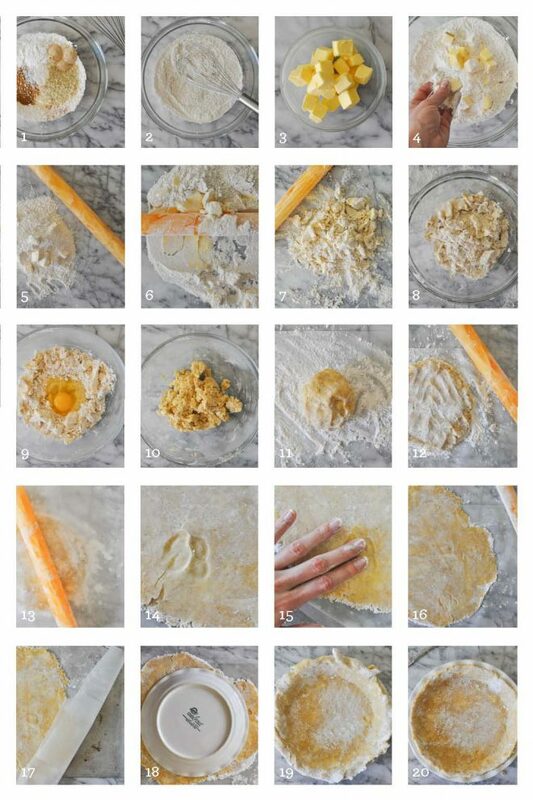 To roll the dough out, dust a sheet of wax paper with a generous amount of arrowroot flour. Place the dough in the center. Using the palm of your hand, press the dough into a 2” thick disk and then dust with more flour. Cover it with an additional sheet of wax paper and then, using your cold rolling pin, roll the dough out into a ¼-inch thick sheet. If the dough cracks as you roll it out, just pinch the tear together. And then press down to flatten the mend. Try to roll it out into a rough circular shape. To lay the dough in a pie pan, slide a baking sheet under the bottom sheets of wax paper so that the dough is sitting on top. Having buttered the inside of your pie pan, lay it face-down centered on the dough. Flip the baking sheet and pie pan over so that the pie pan is right-side up. Pull the baking sheet and wax paper away (slowly) and then guide the dough down into the pan. Mend any breaks with additional dough and trim the edges to your liking. Toss the apples, lemon juice, lemon zest, coconut sugar, cinnamon, nutmeg, and sea salt together in a large bowl. Let them macerate (sit still) on the countertop for 30 minutes – 2 hours. When the apples are finished, strain the apples away from the liquid that has collected at the bottom of the bowl. Pour this liquid in a small sauce pan and cook over medium heat to reduce for about 10 minutes, or until it thickens some. Meanwhile, toss the apples with the 2 tablespoons of arrowroot. When the drippings have thickened, pour it over the apples and stir to incorporate. Pour the apples into the pie crust and spread out until you have an even thickness. For the crumble topping, combine all the dry ingredients into a large bowl. Using your hands, massage the softened butter into the dry ingredients so that it starts to form a crumbly texture. Sprinkle it evenly over the top of the pie. Bake on the very bottom rack of the oven at 425 F. Set the timer for 30 minutes and then carefully place a sheet of foil over the top of the pie (this helps to keep the edges from over-browning) and bake for an additional 15 minutes. Let the pie cool completely (4 hours will do) before serving. 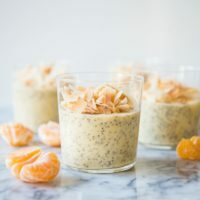 Top with coconut whipped cream. Combine all the ingredients in a chilled mixing bowl and turn stand mixer on medium/high for 5 minutes, or until stiff peaks form. For a lattice topping instead of crumble: Make an additional pie crust and cut it into 2-inch thick strips. Then, carefully weave the dough strips together, leaving a 1-2” gap between each one. Trim the edges and press down with either your fingers or a fork to seal. Dust with the 2 teaspoons of coconut sugar.